An A to Z as a new month begins …. I’m not quite sure where April has gone. My computer had a bit of a meltdown. I’ve found myself wanting to do things around the house – after work and dog- walking – rather than sit to read or write. But now – I think – things are settling down again. May is going to be different. And, once again, I’m starting again with an A to Z …..
B is for BLUEBELLS. I love the bluebell season, and chances are that – weather permitting – Briar will be having a walk in Bluebell Woods at the weekend. C is for CAOUA COFFEE: lovely patterns for socks and scarves. D is for DOG BAN. It starts today on the beach across the road, and Briar will miss going over there. Her trained humans will, of course, take her to other beaches where she is allowed until 1st October when she becomes legal again. E is for EMMA BOVARY. I drifted away from the readalong, but I have been inspired and I will re-read Madame Bovary in the not too distant future. G is for GRANIA: The Story of an Island by Emily Lawless. An intriguing, late Victorian novel that I am reading slowly and steadily. H is for HARRISTOWN. A copy of The True and Splendid History of the Harristown Sisters by Michelle Lovric arrived in the post today, and it looks wonderful. I is for IRWIN. I was very taken with And Still She Wished for Company and now I have another new book by Margret Irwin lined up – These Mortals. J is for JULIET STEVENSON. I have the book but I’m thinking that I’d like to listen to her reading of The Signature of All Things. K is for KNITTING NEEDLES. A while ago I moved them from pots to a drawer, but that didn’t really work, so I spent a couple of hours sorting things out and putting them all back in pots again. L is for LOOK – THERE’S A SEAGULL ON THE GARDEN WALL! It’s a young one, it comes several times a day, and it stands there for ages. M is for MILK BOTTLE SYMPHONY by Saint Etienne. I heard it as part of a random soundtrack (courtesy of Last.fm) that was in the background as I was reorganising my knitting needles. N is for NURSING HOME. My mother is very frail now, and I am so lucky that she is in a good home and that the staff are taking good care of her. O is for 110 – I’ve already hinted that I’d like The Persephone 110 – a diary for 2015 – next Christmas. I’m not a diarist but I’d use it to record my year in books. Q is for THE QUICK by Lauren Owen. I loved the opening but I’ve not really wanted to read gothic lately. Its time will come …. R is for RUG MAKING. A few years ago my mother – wanting a change from knitting – made a latch-hook rug. She did everything except binding the edges, and I’m thinking that I should really get the necessary supplies and finish it off properly. T is for TOLSTOY. I’m still listening to Anna Karenina. V is for THE VISITORS. I loved Rebecca Mascull’s novel of that name earlier in the year, and now I have another new book with exactly the same title in my library pile. The Visitors by Sally Beauman …. W is for WILD STRAWBERRIES. Virago is reissuing Angela Thirkell’s books at such a rate that I can’t keep up, but there are worse problems to have. Wild Strawberries is next on my list. X is for EXITS, I’ve had a bit of a clear out, and now I have six bags of books and a bag of yarn waiting to be taken to a charity shop. Y is for A YOUNG SCHOOLTEACHER’S DIARIES 1939 – 1945. I found a copy of Those Wonderful Rumours by May Smith in our local Oxfam shop, and a paperback copy of Elizabeth Goudge’s autobiography too. I loved The Ladies Paradise and I’d hoped that this would show me the backstory, but if it was there it was lost among a mass of characters. 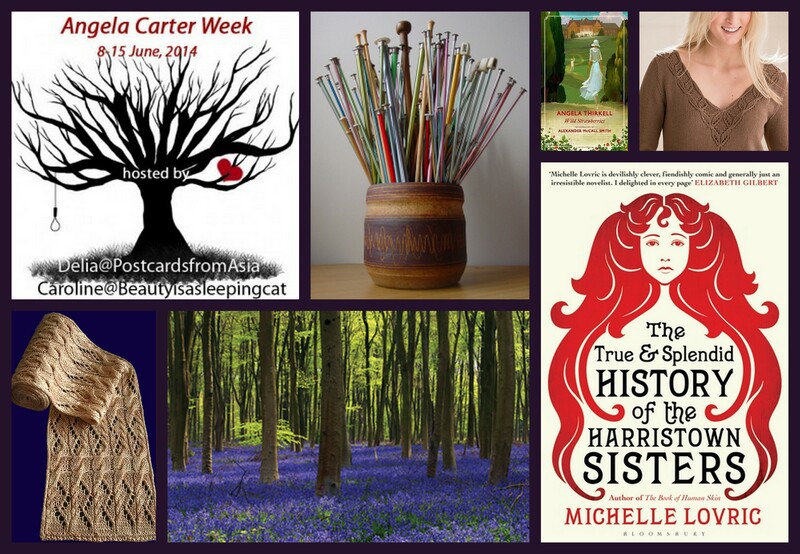 Thanks for much for mentioning Angela Carter Week. I’m looking forward to see your choices. Thank you – for coming up with the idea and setting the wheels in motion. I’m thinking I might go back and re-read my first Angela Carter – The Magic Toyshop – and see where it leads me. What a great post. I have quite a few Angela Carter books that I haven’t read (no surprise there) so thanks for the heads up about Angela Carter week, I will have to join in. Juliet Stevenson is one of my favourite actors, I would listen to her read anything! Angela Carter was a significant influence on my reading at a young age, and I haven’t read a book by her that I haven’t liked or admired in some way. Juliet Stevenson has done a few audiobooks – I have her reading of Middlemarch in my sights too, but that will be rather further in the future. I always enjoy your A-Z posts – such an interesting mix! It sounds like the beach ban is a seasonal one – is that because of summer visitors? I haven’t heard of the May Smith book, but I love diaries, so I will have to check with our interlibrary loan people. I hope this month brings good things! For those of us too far away for a cup of tea and a chat the A – Z posts are the next best thing. Enjoy your weekend and give Briar a cuddle for me. I didn’t get on with The Quick and I am so disappointed because I wanted to love it. I wasn’t expecting the supernatural. I hope you have a lovely May and I’m glad to see you back! Love to hear how things are with you from these posts. I have been a bit the same, not in the mood for writing and sometimes not having the time too! I have a feeling that it will all come out in a few posts over the next few days! Too bad Briar can no longer go to her favourite beach until October, as I'm sure she's very well trained. I'm glad your mother seems to be in very good hands :). Here's hoping you have a nice May! I hope you have a lovely May! Enjoy re-reading Madame Bovary, I think if I re-read it now, and I would like to one day, it would mean so much more to me/many different things, since reading it for French A-level. Hope you had a lovely walk in the bluebell woods.